The act is named after its founders Eleanor Underhill and Molly Rose Reed, but Underhill Rose has evolved into a fully-fledged trio with the full time participation of bassist Salley Williamson. Together, with the help of the assembled session musicians, the trio from Asheville North Carolina have made a sensual record reflecting the stripped backed basics of it roots and country core. THE GREAT TOMORROW is Underhill Rose’s third album release and is scheduled to be the centre-piece for the group’s first exploration into the UK. They will find an evolving market ready to embrace a soundtrack underpinned by the banjo and pedal steel, especially one sprinkled with enticing songs and the ever popular harmony approach to singing. Overall the album is a positive recording, quite often simplistic in its themes and gently drifting along in an unhurried timeless haze. The many qualities of this record start with both the vocals and the musical content before edging into more popular territory with a multitude of hooks. From the exceptional verse melody of five star track ‘Love Looks Good on You’, with its cutting opening line ‘you don’t like country music, but it still reminds me of you’ to the ear pleasing refrain on ‘Montana’, the album is packed with moments to sit up and take note. The latter is one of the album’s more explicit lyrical elements as it explores the essence of memory. Other stand-out merits from this Molly-penned track are the violin interludes which appear at the opening and the mid sections, alongside the perpetual pedal steel, which along with banjo is seemingly and pleasantly omnipresent. On the topic of song writing each member makes a steady solo contribution with Eleanor leading the way with five compositions, followed by Molly with three and Salley on two. The other track on this eleven song collection is a cover of the eighties Paula Abdul smash hit ‘Straight Up’. Obviously it has been done in a complete old time roots style, but still conveying the mass appeal that radiated from this song across the world at the time. The two songs written by Salley both make a considerable mark on the album’s landscape. ‘Our Time is Done’ appears as the lead off track, doubles up as the promoted song via video and ensures Underhill Rose pierce the surface upon immediate listen. This song which has a folk feel to it, especially in its lyrical structure and left field relationship content, is followed later by the enterprising ‘Shine’, not of the sun variety but explicitly explained in the chorus ‘the moon shines east, the moon shines west, but the moonshine from our cellar’s best’. This comes across as one of the darker songs on the record and sees Molly adopt a slightly different vocal style. Eleanor and Molly often interchange lead vocal across the record with the additional harmonies being ever present in their beauty. Instrumentally, Molly settles on guitar, with her other song compositions being the life and death basic perceptive piece ‘When I Die’ and the more contemporary sounding ‘My Friend’, detailing a falling relationship. Eleanor’s claw hammer banjo playing is one of the highlights of the album and from a writing aspect she contributes the slightly abstract ‘Whispering Pines Motel’ and the philosophical closing title track, ‘The Great Tomorrow’, complete with its positive warm glow and final parting shot of drifting pedal steel. ‘Not Gonna Worry’ and ‘Rest Easy’ are the final two songs, once again flowing from the pen of Eleanor, with the latter one being representative of the many hooks that pack the album with appeal. Stateside, the Americana Music Association has recognised the talent of Underhill Rose and as well as the release of this new album in March, the trio will be playing some shows in the UK to promote the record. 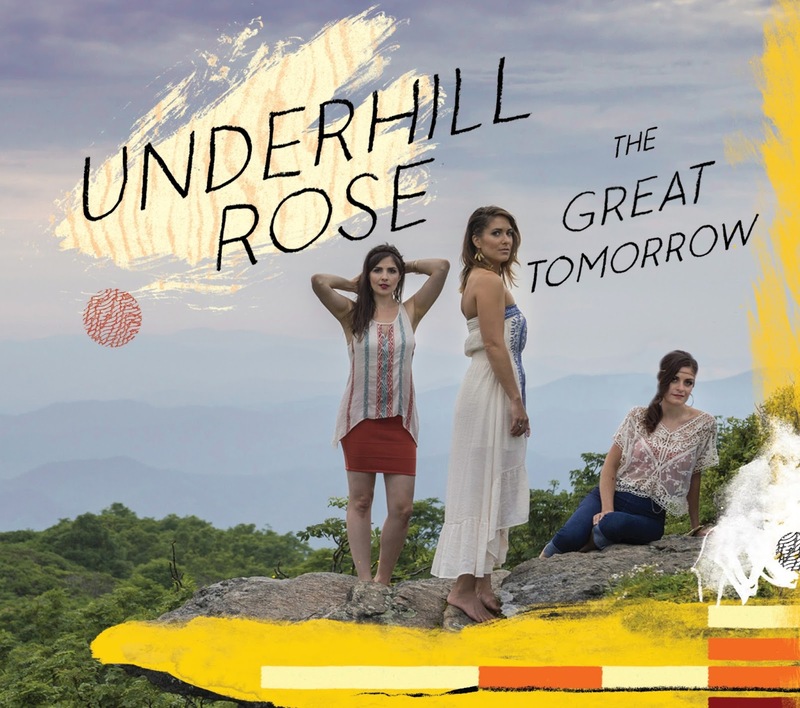 THE GREAT TOMORROW could well be the start of a prosperous future for Underhill Rose on the international stage and its laid back vibes, interesting song themes and neat presentation make it an album worth checking out.